Feathers are the major byproducts of poultry industry and considered as waste. Feathers (composed of protein keratin) are metabolized by a number of microorganisms as a source of carbon and nitrogen. Degradation of feathers results in production of amino acids and peptides, which can be employed as precursors for plant growth-promoting metabolites such as indole acetic acid, ammonia and HCN. The aim of the present investigation was to assess the influence of these metabolites (termed as feather protein hydrolysate) on plant growth promotion activity of keratinolytic bacterial strain Bacillus subtilis PF1. Strain PF1 exhibits potent keratinolytic activity and can efficiently degrade 10 g/l chicken feathers under submerged cultivation with 81.4 ± 4.40 U/ml keratinase activity. Different concentrations of feathers supported the production of indole acetic acid by strain PF1. Strain PF1 produces maximum indole acetic acid (46.2 ± 0.21 µg/ml) in the presence of 2.0 % feathers at 120 h of incubation. The indole acetic acid production was confirmed by thin-layer chromatography and Fourier transform infrared spectroscopic analysis. However, increased concentration of feathers exhibited negative effect on phosphate solubilization due to increased alkalinity. HCN production also exhibited positive correlation with concentration of feathers. Finally, plant growth of Vigna radiata in the presence of strain PF1 with chicken feathers in soil was investigated, which showed good plant growth promotion activity. Increased ratio of C/N in soil also supported the plant growth promotion activity of feathers. Feather degradation property of B. subtilis PF1 could be efficiently utilized for feather waste management. The metabolites released by feather degradation along with strain PF1 could be successfully employed as an economic source of nitrogen fertilizers for plants. Maintenance of high agriculture productivity is a prerequisite to cater the demands of growing population (Perez-Montano et al. 2014). To increase the productivity of crops, synthetic fertilizers are being used all over the world. Overuse of these fertilizers leads to their gradual entry into water systems through rain water and causes eutrophication. Recently, several biological approaches for improving crop productivity are gaining strong impetus among agronomists and environmentalists. Among these approaches, the use of plant growth-promoting (PGP) bacteria is believed as the most competent and economical system for escalating the yield of various crops (Ahemad and Kibret 2014). Various microorganisms such as the Bacillus, Pseudomonas and Trichoderma have been considered as potential plant growth-promoting factors and augment crop production under field conditions (Verma et al. 2013). Various plant growth-promoting factors such as indole acetic acid (IAA), phosphate solubilization and nitrogen fixation, and bio-control attributes like production of HCN, siderophore, hydrolytic enzymes and antibiotics have been previously reported for Bacillus sp. (Senthilkumar et al. 2009, Kumar et al. 2012, Sunar et al. 2013). Chicken feathers are keratin-rich waste generated in large amount from poultry processing industries. High mechanical stability and rigid nature of keratin make them resistant to degradation by common proteolytic enzymes present in nature (Lateef et al. 2010). Release of large amount of chicken feathers from poultry processing industries causes their accumulation (Tatineni et al. 2008). Inappropriate disposal of these wastes by the methods such as dumping, land filling and incineration not only leads to environmental havoc but is also responsible for loss of useful biological resources such as protein, enzymes, etc. (Lasekan et al. 2013). Preparation of biofertilizers using chicken feather wastes is attracting the focus of many research scientists. Feather meal is a cheap and easily available source of nitrogen (15 % N) and may serve as a potential biofertilizer (Jeong et al. 2010a). The plant growth-promoting activity of protein hydrolysates could also be effectively applied in agriculture (Tiwary and Gupta 2010). Thus, microbial degradation of feather represents an alternative for development of slow-release nitrogen fertilizers. Indole-3-acetic acid (IAA) is a major plant growth regulator which increases the accessibility of nutrients to plant and also promotes root growth (Vessey 2003). The degraded product of chicken feathers could generate appropriate amount of tryptophan which is the key source of IAA synthesis (Tsavkelova et al. 2012). Indole acetic acid-producing and phosphate-solubilizing bacteria are capable of stimulating plant growth (Das and Tiwary 2014). The present study deals with the study of plant growth-promoting attributes of keratinolytic bacterial strain Bacillus subtilis PF1. A comparison of plant growth-promoting factors, namely IAA, ammonia, phosphate solubilization and HCN production, was quantitatively performed in the presence and absence of chicken feathers, aiming to evaluate any positive and negative role of feather metabolism in these attributes. Further, Mung bean (Vigna radiata) is an important pulse crop belonging to the family Fabaceae and chiefly grown for its edible seeds rich in protein. It also contributes to a good source of essential fatty acids, tocopherols, sterols, sugars, organic acids, amino acids and amines (Silva et al. 2013). Therefore, the role of keratinolytic strain B. subtilis PF1 for growth of V. radiata during feather degradation was also determined. A potential keratinolytic strain B. subtilis PF1 (accession no. KM062030) isolated from feather disposal site of Bilaspur, Chhattisgarh, India, was used in the present investigation. The strain was grown on feather meal broth (FMB) consisted of the following (g/l): K2HPO4, 0.3; KH2PO4, 0.4; NaCl, 0.5; feathers, 10. Peptone water was used for inoculum preparation, which was consisted of the following (g/l): peptone, 10.0 and NaCl, 5.0. 5 % (w/v) of 24-h-old culture of bacterial strain was transferred in 500-ml Erlenmeyer flasks containing 250 ml FMB. The flasks were incubated in a shaking incubator (Remi CIS-24 BL, India) at 150 rpm and 32 °C. Feathers used in the study were obtained from a regional poultry farm, Bilaspur, Chhattisgarh, India. They were washed thoroughly with detergent followed by water for 2–3 times to remove dust and blood stains and then were dried in hot air oven for 24 h at 60 °C. The chemicals used in this study were of pure analytical grade and purchased from Sigma chemicals and HiMedia, India. Initially, strain PF1 was inoculated in peptone water and incubated for 24 h at 150 rpm and 32 °C. In 500-ml Erlenmeyer flasks containing 250 ml minimal medium supplemented with 1 % (w/v) chicken feathers, 5 % inoculums were transferred. The flasks were incubated for 24 h at 150 rpm and 32 °C. Aliquots of 2 ml were withdrawn after every 24 h from each triplicate culture to evaluate growth, keratinase activity, soluble protein and amino acid production. Estimation was performed from culture supernatant obtained by centrifugation of culture at 12,000 rpm for 10 min. Growth rate was determined by tetrazolium chloride (TTC) reduction method as described by De Logu et al. (2001). Briefly, 10 µl of 0.02 % TTC solution was added to 1 ml culture suspension and incubated at 30 °C for 30 min, and the cell suspension was then subjected to centrifugation at 8000 rpm for 10 min. The cell pellet was treated with 95 % ethanol, incubated for another 30 min and again centrifuged at 8000 rpm for 10 min. The absorbance of supernatant was recorded at 480 nm. Keratinase assay was performed according to the method of Anbu et al. (2007) with minor modifications. Twenty mg (20 mg) of chopped feathers were suspended in 3.8 ml of 100 mM Tris–HCl buffer (pH 8.0) followed by addition of 200 µl of culture supernatant to it. This preparation was incubated at 32 °C and 150 rpm for 1 h and the reaction was stopped by cooling the tubes in ice-chilled water. After centrifugation at 5000 rpm for 5 min, the absorbance of supernatant was measured at 280 nm. Control samples were prepared in a similar manner except that the enzyme was replaced by the same volume of 100 mM Tris–HCl buffer (pH 8.0). One unit of enzyme activity was considered as the amount of enzyme required to release 1 µmol/min of tyrosine under the conditions mentioned above. Similar experiments were performed for measuring protease activity using casein as a substrate. The other parameters were followed same as keratinase assay. Bradford method (1976) was used to determine protein concentration and bovine serum albumin (BSA) as standard. The absorbance was determined spectrophotometrically at 590 nm using UV–Vis spectrophotometer (UV-1800, Shimadzu). Total amino acid content was measured by manual ninhydrin method using leucine as standard (Cheng et al. 2010). The bacterial strain was cultured in the presence and absence of different concentrations of tryptophan, and the production of IAA was estimated spectrophotometrically at 530 nm. Minimal media containing 1 % (w/v) of chicken feathers and different concentrations of tryptophan (0.02–0.2 mM) were inoculated with bacterial culture suspension and incubated at 32° C and 150 rpm. Aliquots of 2 ml were retrieved from each triplicate culture after every 24 h to determine the concentration of IAA. The supernatant (1 ml) of grown culture was mixed with 500 µl of Salkowski reagent (2 % of 0.5 M FeCl3 in 35 % perchloric acid) and the concentration of IAA was estimated after 20 min by measuring the absorbance at 530 nm (Jeong et al. 2010a). The absorbance was compared with standard prepared by using IAA (HiMedia, India). The influence of different feather concentrations (0.25–2.0 % w/v) along with 0.5 mM tryptophan in culture medium was also estimated over the production of indole acetic acid. Minimal medium containing 0.5 mM tryptophan was considered as control. Thin-layer chromatography (TLC) and Fourier transform infrared spectroscopy (FTIR) were utilized to analyse IAA production (Sachdev et al. 2009) using commercial IAA (Himedia, India) as standard. For acidic extraction, 72-h-grown culture supernatant of feather lysate was adjusted to pH 2 with 0.1 N HCl and subsequently extracted with equal volume of ethyl acetate. The ethyl acetate fraction was concentrated in a vacuum evaporator (Concentrator plus, Eppendorf), mixed with KBr and analysed using FTIR (FTIR 8400, Shimadzu). Infrared spectrum of IAA was recorded and expressed in wave numbers (cm−1). Ammonia production was determined according to the method of Goswami et al. (2014). Briefly, the strain PF1 was grown on 10 ml minimal media containing different concentrations of chicken feathers (0.25–2.0 %) and incubated at 32 ° C for 72 h. Afterwards, the culture was centrifuged at 10,000 rpm for 10 min to obtain culture supernatant. Subsequently, 0.1 ml of Nessler’s reagent was added in the test tube containing 1 ml culture supernatant and the volume of this mixture was made up to 5 ml by the addition of ammonia-free double-distilled water. OD was measured at 450 nm. The concentration of ammonia was estimated to be in the range of 0.1–1.0 µg/ml using standard curve of ammonium sulphate. The phosphate solubilization by the strain PF1 was determined qualitatively according to the method described by Mehta and Nautiyal (2001). The bacterial strain PF1 was grown in the NBRI-BPB medium composed of (g/l) the following: sucrose, 10.0; Ca3(PO4)2, 5.0; MgCl2·6H2O, 5.0; MgSO4·7H2O, 0.25; (NH4)SO4, 0.1; bromophenol blue, 0.025. The pH of the culture medium was adjusted to 7.0 prior to sterilization (Mehta and Nautiyal 2001). The bacterial culture was inoculated in NBRI-BPB agar medium and kept for incubation at 32 °C for 24 h. The plates were observed for the formation of halos around the inoculated culture. The effect of different concentrations of feather on phosphate solubilization was estimated quantitatively by Mo-blue method (Olsen et al. 1982). Briefly, 30-ml test tube containing 10 ml NBRI-BPB medium and different concentrations of sterilized feather lysate (0.25–2.0 %) were inoculated with 1 ml of bacterial suspension and incubated at 32 °C for 3 days in a shaking incubator at 120 rpm. The cultures were centrifuged at 10,000 rpm for 10 min, and soluble phosphate in culture supernatant was estimated at 882 nm using UV–Vis spectrophotometer (Das and Tiwary 2014). For the qualitative estimation of HCN production by strain PF1, picrate assay was performed as described by Castric (1974). Strain PF1 was streaked on LB medium supplemented with 4.4 g % glycin. A Whatman filter paper No. 1 (soaked in solution of 2 % Na2CO3 in 0.5 % picric acid) was placed in between base and lid of the culture plate. Plates were sealed with parafilm and incubated at 32 °C for 96 h. Production of HCN was indicated by colour changes on filter paper from yellow to orange brown (Goswami et al. 2014). For quantitative estimation of HCN in different concentrations of feather, the strain PF1 was grown in FMB containing different concentrations of chicken feathers (0.25–2.0 %) and 4.4 g % glycin. After 96 h of incubation, the 2 ml culture was treated with 1 ml picrate solution (solution of 2 % Na2CO3 in 0.5 % picric acid) and kept at 30 °C for 24 h. After that, all the cultures were centrifuged at 10,000 rpm for 5 min. The absorbance of supernatant was read at 625 nm (Sadasivam and Mannikkam 1992). Increasing absorption at 625 nm was considered as an increase in HCN production. Certified seeds of V. radiata released by the Department of Food and Agriculture, Government of Chhattisgarh, India, were used in this study. The seeds of V. radiata were surface sterilized with 2 % mercuric chloride for 20 min and were washed thrice with sterilized double-distilled water. Twelve seeds (four seeds in each sterile tissue culture tube) were placed in sterilized soil containing water only (control S1), water and 108 bacterial cells ml−1 (S2), and sterilized feathers with bacterial suspension containing induced 108 bacterial cells ml−1 (S3). Bacterial cells were previously grown in 1.0 % feather-containing minimal media. After a week of incubation, the germination percentage of the seeds and radicle and plumule length were determined. Three sets of pot soil were used for chemical analysis, namely untreated or control (devoid of bacterial suspension and feathers), soil treated with bacterial suspension and soil treated with both bacterial suspension and feathers. The samples were collected after 10 days of incubation for physiochemical analysis. The suspension of soil samples was prepared in distilled water (1:3 w/v) and pH was measured. For the determination of total nitrogen content, Kjeldahl method (Eaton et al. 1995) was used and total carbon content was estimated by Tyurin method (Nustorova et al. 2006). The contents of P, K, Na, Ca and Mg were determined by atomic absorption spectroscopy (Shimadzu, AA-6200). All the experiments were performed in triplicate and the results were represented as mean ± standard deviation. The results were compared by one-way ANOVA followed by Tukey–Kramer comparison test. The time course of feather degradation by strain PF1 was determined during submerged cultivation in minimal medium containing 1 % (w/v) feathers. Growth profile of strain PF1 indicated that the selected strain efficiently utilized chicken feathers as a sole source of carbon and nitrogen and attained highest growth at the 5th day of incubation (Fig. 1a). Maximum soluble protein (533.76 ± 6.6 µg/ml) production was observed at the 5th day of cultivation or late exponential phase of growth (Fig. 1b). The time course of amino acid production exhibited similar pattern as keratinase (Fig. 1b). However, the maximum production of keratinase (81.4 ± 4.4 U/ml) and protease (172.7 ± 2.8) was obtained at mid-log phase of growth (Fig. 1c). The increased production of keratinase leads to the increased production of amino acids during feather degradation. The production of IAA was evaluated during submerged cultivation in the presence and absence of l-tryptophan in feather meal broth. The result indicated increased production of IAA with increasing concentration of l-tryptophan from 0.02 to 0.2 % (Fig. 2a). However, the time course study of IAA production reveals its maximum production 145.3 ± 6.6 µg/ml at the 3rd day of incubation with 0.2 % (w/v) tryptophan. Table 1 shows the time course study of the effect of different concentrations of chicken feathers (0.25–2.0 %) over the production of IAA. The IAA production showed linearity with increasing concentration of chicken feathers as compared to control. Strain PF1 produces maximum IAA (46.2 ± 0.21 µg/ml) in the presence of 2.0 % FPH at 120 h of incubation. This result suggested the ability of strain PF1 to synthesize IAA in the presence of feather-degraded metabolites. It has been reported that feather-degraded metabolites contain essential amino acid tryptophan in significant concentration required for the production of IAA (Jeong et al. 2010a). Production of IAA was also estimated by TLC method. The Rf value close to commercial IAA confirmed the presence of IAA (unpublished data). Sample contains IAA band retrieved by TLC and analysed with FTIR analysis. The IR spectrum of the purified compound showed the stretching of OH and C = O at 3383.2 and 1697.3 cm−1, respectively, which is similar to the IR spectrum of standard IAA (Fig. 2b). Ammonia production by the strain was confirmed by reddish brown colour in overnight-grown culture of strain PF1 in peptone water after the addition of Nessler’s reagent as compared to control (Fig. 3A). Influence of different concentrations of feather was also evaluated for the production of ammonia. It was observed that the production of ammonia was gradually increased by the feather concentration of the media. Maximum production of ammonia (10.85 µg/ml) was estimated in the presence of 2.0 % chicken feathers (Fig. 3B). Phosphate solubilization was performed in NBRI-BPB agar media and broth. Decolourization of NBRI-BPB media and broth by strain PF1 indicated that the strain was capable of phosphate solubilization. However, a significant decrease in phosphate solubilization was observed as the concentration of feather was increased. Phosphate solubilization was not supported by strain PF1 after the concentration of 1 % feather (Fig. 4). Minimal changes in colour of filter paper (soaked in 2 % sodium carbonate prepared in 0.05 % picric acid) from yellow to light orange indicated weak HCN production by strain PF1. Increasing concentration of feather in culture medium with the addition of 4.4 g/l glycine positively influences the HCN production by strain PF1. Maximum production of cyanide was observed in the presence of 2 % of chicken feather (Fig. 5). Effect of supplementation of feathers on germination and growth of V. radiata was studied after 7 days on incubation (Table 2). Figure 6 clearly indicates the increased growth of V. radiata in the presence of feather-degraded metabolites. The results showed that in the presence of degraded metabolites, 21.7 % increase in radicle length and 36.7 % increase in plumule length were observed when compared with control (water only). Also, 5.7 % increase in radicle length and 15.6 % increase in plumule length were observed in the presence of bacterial suspension containing soil, when compared with control. The results suggest that degraded end products of feather degradation have a beneficial effect on germination and growth of V. radiata. It was observed that the presence of degraded metabolites considerably increases the radicle and plumule length. Three sets of pot soil were used for chemical analysis, namely untreated or control (devoid of bacterial suspension and feathers) (S1), soil treated with bacteria suspension (S2) and soil treated with both bacterial suspension and feathers (S3), were analysed after 10 days of incubation. The pH of the soil treated with both bacterial suspension and feather was found to be slightly increased as compared to control and soil treated with only bacterial suspension due to degradation of feathers. The constituents of necessary elements like C, N, P, K, Ca and Na were altered favourably in S3. Increased C/N ratio and enhanced mineralization in S3 were also observed (Table 3). A significant increase in microbial content was also observed in S3 as compared to other two sets. India is an agricultural-based developing country where a major portion of population depends on agriculture for their livelihood. Due to growing population and land as a limiting resource, there is a crucial need for increasing productivity of soil. Farmers face huge losses in agriculture due to their inability to purchase high-priced chemical fertilizers. There is a growing need for search of alternate sources of nitrogen-based fertilizers, which are cheap and readily available or readily synthesized. The present study confirms an enhanced plant growth-promoting activity by a keratinolytic bacterium during the degradation of chicken feathers. Fewer reports have emphasized the potential role of degraded feathers in plant growth promotion as the end products of keratin degradation are rich source of nitrogen (Choi and Nelson 1996, Kim et al. 2001). Keratinolytic bacterial strain B. subtilis PF1 was isolated from a feather disposal site and was identified on the basis of 16S rDNA analysis. Studies have shown that bacteria from genus Bacillus are known to produce high amounts of enzymes such as keratinase and protease employed for metabolism of protein-containing waste and they also exhibit plant growth-promoting activities. The time course study of feather degradation indicated that the enzyme activity, soluble protein and amino acid concentration reached their highest level at mid to late logarithmic phase of growth. Further incubation declined the proteolytic activity which specified the depletion of medium or feedback inhibition. Similar trend of keratinolysis was observed in previous reports such as in Bacillus cereus MCM B-326 (Nilegaonkar et al. 2007), Bacillus megaterium F7-1 (Park and Son 2009), Bacillus subtilis (Jeong et al. 2010c) and Bacillus cereus (Anwar et al. 2014). Feather degradation potential of Bacillus spp. has been widely reported in previous studies (Lateef et al. 2010, Nilegaonkar et al. 2007, Correa et al. 2010). The time course study of feather degradation by strain PF1 reveals its potential to utilize feather keratin as a sole source of carbon and nitrogen. Many reports have confirmed that IAA exhibits a pronounced effect on plant growth and development. IAA is responsible for the cell division, cell elongation, cell differentiation and pattern formation in the plants (Dastager et al. 2010). Among the different compounds involved in IAA biosynthesis, l-tryptophan (Trp) and indole (Ind) seem to be good candidates as IAA precursors (Francisco et al. 2005). IAA production has been reported by several microorganisms using different precursors such as tryptophan-mediated synthesis of IAA by Pseudomonas fluorescens (Kochar et al. 2011) and indole-3-acetamide-mediated IAA biosynthesis by Fusarium species (Tsavkelova et al. 2012). However, very few reports are available regarding IAA production through feather degradation (Jeong et al. 2010a). The hydrolysis of feathers results in a significant amount of l-tryptophan (Jeong et al. 2010a) and most of the keratinolytic microorganisms having the ability to produce IAA from l-tryptophan. Therefore, keratinolytic microorganisms may offer economical tools for the synthesis of IAA by the successful degradation of chicken feathers. The result has also revealed that the production of IAA was accelerated with the addition of l-tryptophan. Similar pattern of IAA production was obtained by Stenotrophomonas maltophilia R13, Xanthomonas sp. P5 and Bacillus subtilis (Jeong et al. 2010a, b, c). An increased synthesis of IAA was observed with the increasing concentration of chicken feathers. It is due to the fact that during degradation of chicken feathers, tryptophan present in keratin is released into the culture medium which is used by the bacterium to produce IAA (Jeong et al. 2010a). Results of this study confirm that metabolites produced after degradation of chicken feathers can be employed for synthesis of IAA by the bacterium. The important role of ammonia as a bio-control agent has already been reported (Trivedi et al. 2008). The present study described the production of ammonia during feather hydrolysis by strain PF1. Ammonia production has been also reported by Bacillus subtilis isolated from forest soil (Jeong et al. 2010c). Phosphate is abundant in soil and plays a major role in plant growth. The overall phosphate use efficiency following the application of phosphate fertilizer is very low because of the formation of insoluble complexes (Dastager et al. 2010). Phosphate solubilization is another good property of strain PF1, which enhances the uptake of phosphate thereby promoting plant growth for better yield. However, increased concentration of degraded metabolites of chicken feather exhibited a negative effect on phosphate solubilization. This result is supported by the fact that phosphate-solubilizing microorganisms solubilize insoluble form of phosphate by acidification (Kaur and Reddy 2014) and feather-degraded metabolites are alkaline in nature which inhibits phosphate solubilization. This shows that in order to fulfil the phosphate requirement of plants, phosphate should be provided externally when feathers are used as biofertilizers. HCN indirectly enhances the plant growth by acting as a microbial antagonist and is yet another influential trait of PGPR (Goswami et al. 2014). The present study indicates that the feathers augmented the production of HCN which would be advantageous for eradication of plant pathogens. V. radiata was selected to determine the effect of degraded metabolites of chicken feather. Being an important pulse crop of Fabaceae family (Silva et al. 2013), V. radiata is grown in many tropical and subtropical countries for beneficial health effects (Das and Tiwary 2014). The seeds were selected owing to its short germination time and ease of handling. Degraded metabolites of chicken feathers positively affected the germination of mung bean probably by providing the nitrogen sources. 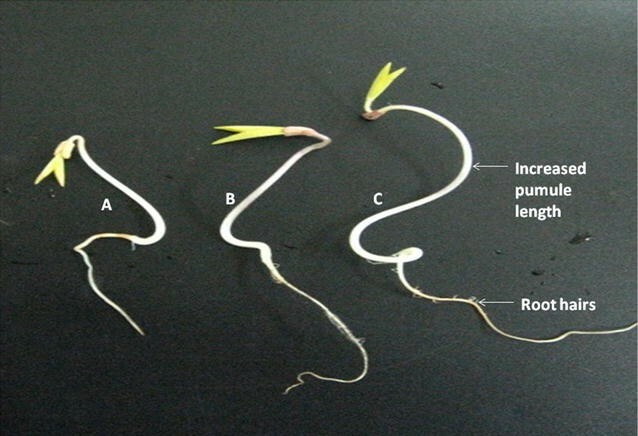 Length and numbers of root hairs increased significantly in feather-digested soil. Increased root length and numbers of root hairs also increase the surface area of root which enhances the absorption of nutrients from soil. This result is comparable with that of Paul et al. (2013) who reported the role of feather hydrolysate in enhancing the number of root hairs. Increased weight of shoot and plumule length revealed the promotion of plant growth. Similar results were also obtained by Anwar et al. (2014), who observed growth promotion in Brassica juncea after inoculation with B. cereus. It has been proposed that the feather hydrolysate provides the metabolites required to synthesize the major nutrient and hormones. A slightly increased pH was observed in soil amended with degraded feather metabolite (S3) as compared to other two sets which indicated the release of ammonia by deamination of peptides and amino acids as reported in Bacillus licheniformis ER-15 (Tiwary and Gupta 2010). Reports have shown that feathers disintegrate slowly and thus act as good sources of slow-release fertilizers (Hadas and Kautsky 1994). Currently, we are studying in situ degradation of raw feathers in soil by this isolate in microcosm-based experiments. We have observed that the direct degradation of feathers in soil by this strain would open a possibility for developing a suitable strategy for removal of feather waste and its bioconversion into fertilizers, which can be supplemented to plants. Feather degradation property of B. subtilis PF1 could be efficiently utilized in feather waste management. The metabolites released by feather degradation along with strain PF1 could be successfully employed as an economic source of nitrogen fertilizers for plants. Although the other parameters such as phosphate solubilization and mineralization could positively influence the growth of mung bean seedlings, IAA production by the B. subtilis PF1 using chicken feathers is proposed as a major means of attaining growth. KB contributed to experimental design, data acquisition, result analysis and manuscript preparation. VC contributed to FTIR interpretation and manuscript preparation. RB contributed to experimental design, data interpretation and manuscript correction. All authors read and approved the final manuscript. We would like to thank Columbia Institute of Engineering and Technology for FTIR analysis.